For a quarter of a century, Rosetta Stone has been pioneering the development of computer-based language learning. In these years our product has seen many developments and improvements, from CD-ROM based learning to pronunciation training, online tutoring and mobile apps. Now, to coincide with our 25 year birthday, we have released the very latest version of the world’s favourite immersive learning system. 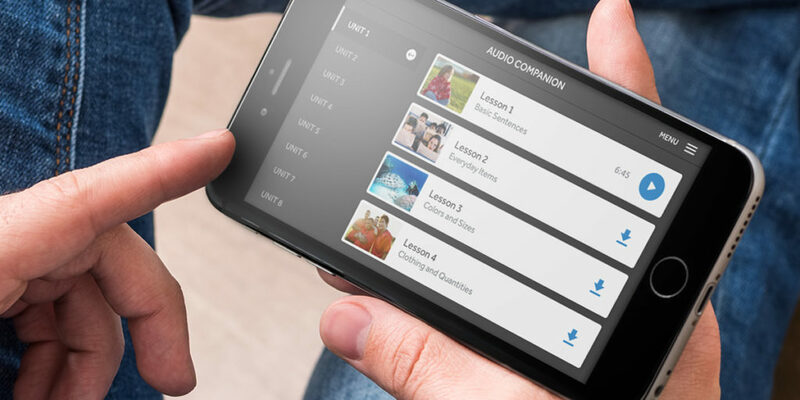 The new-look Rosetta Stone is 100% focused on getting learners to speak well. The pronunciation software is right at the heart of everything we offer, helping with reading exercises, role-playing, and memory games. It’s all to reinforce our philosophy that learning is most efficient when you speak the words out loud. Rosetta Stone’s difference is based on one simple idea: to take the translation out of language learning. Instead, we use the voice of hundreds of native speakers and advanced speech recognition software to recreate the experience of being in a different country. It’s a system that encourages intuitive understanding and learning by doing. The new-look Rosetta Stone focuses on our core belief: that speaking the language well is the key to remembering and understanding. The new tool incorporates our most advanced pronunciation tool yet. The speech recognition software feeds back to you instantly, correcting mistakes and helping you to get the sound of the words you learn just right. Speaking it well from the start is a big help in terms of retention and motivation. The New Rosetta Stone has an updated Stories feature that corrects you as you read aloud. It’s just like a parent teaching child. It reads the story to you and then listens as you read it back, correcting when you make a mistake and asking you to try again. The new Phrasebook teaches the sound of the language in the situations you need it for. Real life scenarios are recreated in the new tool. Every phrase is read out by the system and then you are prompted to repeat it out loud. This process ensures that you can say the key phrases with real confidence. Use it on the mobile app and you can check the sound of your phrase, just before you go and say it in a ‘live’ conversation. The new Rosetta Stone has many more features available through its mobile version. Download the mobile app and you will be able to access the whole experience on the go, using every spare minute productively. You can download all the learning materials you need before you leave the house and work through them without an internet connection. The very latest version has been timed to release on the 25 year anniversary of Rosetta Stone; a quarter of a century during which the company has been the leader of computer-based language learning. The original idea was such a powerful one: to use technology to make immersive learning possible even if you lived on the other side of the globe from where the language was spoken. Today Rosetta Stone continues its progression and remains unchallenged as the leading software for immersive – no translations – learning.